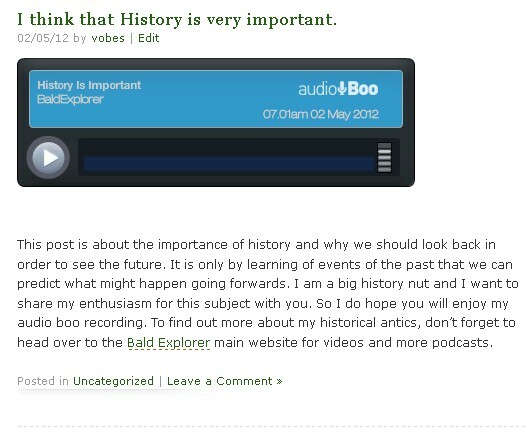 My new audioboo website with blog posts in audio format. I know that some of my followers enjoy podcasts and do not always have time to read the blogs as they go up. Well, I have an answer for that to help them out. I have started a fresh website which lists all my posts and articles but in a recorded format. By using the services of the very popular AudioBoo podcast format, I am recording the written content in my sound studio and uploading. At the moment I have the free account which permits up to three minutes of recording time. If this proves popular I will bite the bullet, open my wallets and purchase a 30 minute account. I believe this approximately £60 a year, so not too bad. I would love to know if you like this service or have any comments about using AudioBoo, so do please send any feedback to either the Bald Explorer Audio Blog site or of course to this post. The Bald Explorer Audio Blog site is ready for you right now!